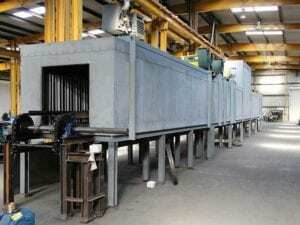 What is an Industrial Conveyor Oven and What is It Used For? Home What is an Industrial Conveyor Oven and What is It Used For? Demand for your product has grown so much that manufacturing your product one batch at a time is inefficient or is creating a bottleneck in the manufacturing process. It takes a lot of time to load, heat, cool and unload the product in a batch oven. An industrial conveyor oven allows the product to “flow through” the system. This often results in significant energy cost savings because of the waste involved with heating a batch oven, then allowing it to cool down and repeating the process. Adding an industrial conveyor oven into an existing production line can significantly reduce and possibly even eliminate the need for an operator to be involved with the process. This may reduce operator errors and create a more consistent quality of product. Since there are thousands of different products requiring thousands of different heat-treatment processes, it is safe to say that most industrial conveyor ovens are unique. Custom racks or hanging fixtures – These are highly customized in order to help keep the product in place during the heating process. Conveyors – There are several different ways to move your product through the industrial oven. Overhead conveyors, wire-mesh belts, and pusher dog-chain assemblies are just a few of the methods that can be incorporated to help move your product through the heating process. Guillotine doors – Help manage temperature within the oven. At Epcon, we have over 40 years of experience in industrial oven design. Reach out to one of our industrial oven design experts today by completing our simple online Get a Quote form, call us at (936) 273-3300, or send us an email at epcon@epconlp.com. ← What is the Difference Between a Regenerative Thermal Oxidizer and a Recuperative Thermal Oxidizer?